The same pixel which allows you to create custom audiences, also allows you to track the monetary effect of your Facebook Ad campaigns. This, of course, means you can track your ad's ROI to determine if you're getting your money's worth (and take steps to improve your success). 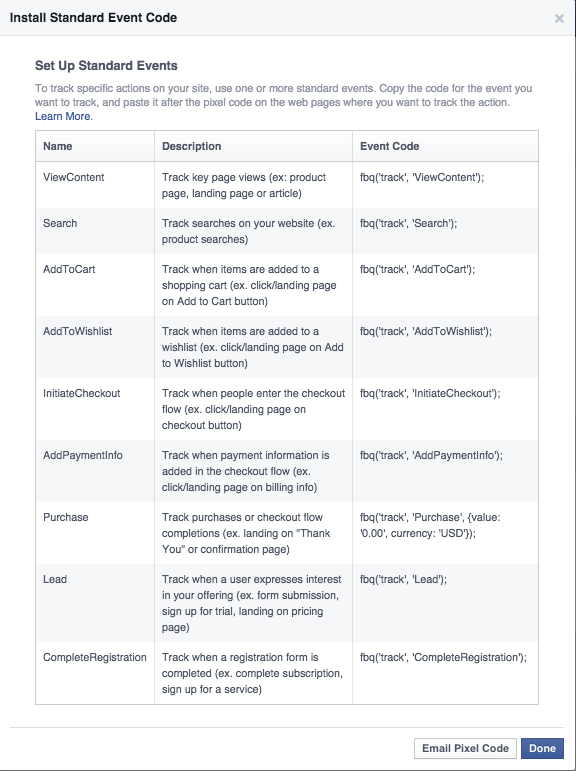 While I've written previously on how useful Facebook Ad's conversion tracking is for ecommerce companies, it's also useful for B2B and SaaS. Step #1: Copy and paste the pixel code provided by Facebook. Copy and paste the following code between and on the page of your website you want to track actions. For example, to track registrations, place the code on your 'registration completed' web page. To verify that the pixel is working correctly, test it by navigating to the web page you put the pixel on. If it's working, the pixel will send that information back to Facebook. 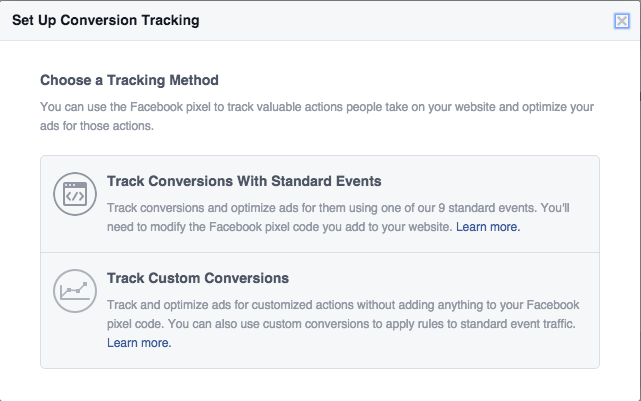 Come back to Facebook to start using your website conversion-tracking pixel in your campaigns. Step #2: Head to "Tools" in the toolbar and choose "Custom Conversions:"
Follow the instructions on the screen and copy your selected conversion goal into the code of your existing pixel. 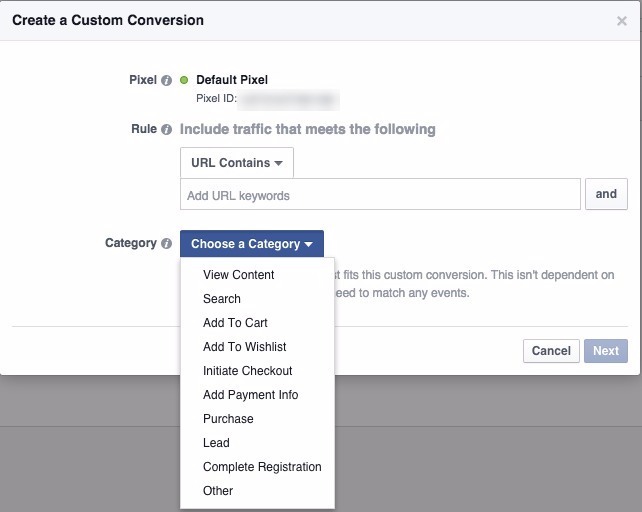 For ecommerce sites, custom conversion tracking is awesome because you can determine how many of your Facebook Ad "clickers" went all the way through your funnel and converted on your products. For SaaS or B2B sites, you can use custom conversion tracking to track the number of Facebook Ad "clickers' who went to your signup page, and even which plan they converted on. For instance, drop "https://www.saasacme.com/dashboard/?upgrade=true&id=59&plan=pro&type=monthly" into the URL box, choose "Purchase" and label your custom conversion as "monthly plan purchase completion" with a value of $59 (or whatever your monthly plan is). That "value" box will very effectively allow you to track ROI on your ads, as you'll be able to see the exact end-value of people who clicked on your Facebook Ad. Note: By the way, Facebook Power Editor has a "Duplicate' function for your ads, which makes it super easy to create ads with the same target audience but different messaging or images. If you're driving the same target audience to different products or plans, for instance, you can use this duplicate function alongside custom conversion tracking to track the success of your ads for different products.